Situated at Pune Nagar Highway in Wagholi, Chokhi Dhani, is a one-day budget getaway if you want to experience full blown Rajasthani culture and cuisine, all under one roof, starting at INR 750. Spread across seven acres of land, Chokhi Dhani Pune is a combination of good food and great entertainment. 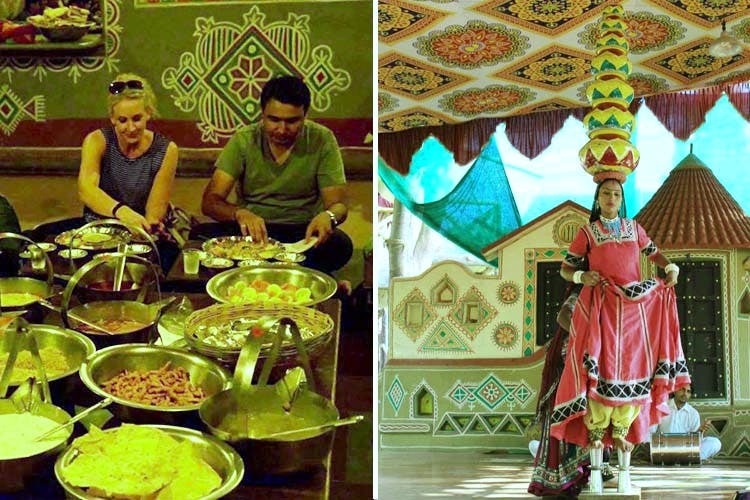 The place boasts of 28 Rajasthani delicacies and over 75 entertainment activities that include folk dance, khao gulli, kacchi ghodi performance, body massage, fortune telling, rope balancing act and more. No sooner you enter Chokhi Dhani than the hosts welcome you inside with a glass of refreshing jaljeera or nimbu pani. It’s an open-air setup designed to replicate a typical Rajasthani village. Listen to soulful folk music while you munch on some scrumptious snacks like the Bikaneri kachori with kadi, khamen, jalebi and masala chai. The bullock and the horse cart rides are super-fun! The Kathputali dance show and the special performances by a magician is worth-watching since you really don’t get to experience these everyday. But, we feel the real deal-maker at Chokhi Dhani is the authentic Rajasthani dinner meal at the end of the day. Deep-fried fulkas with dal panchili, churma, khichda and paneer butter masala are love! Don’t forget to dig in to some freshly made malpuas and chilled kulfis for desserts. Rajasthan trips can get expensive! But what if you experience a slice of their rich tradition in Pune for just INR 750? Chokhi Dhani makes this possible. So don’t think too much. Do something different during the weekends, book your tickets here.